Originally published in The International Journal of Communication, of USC Annenberg. The basic thesis of this book is that Google assumes roles and projects that, because of their central importance in society, should be carried out and led by public institutions, or at least subjected to regulations that assure the interests of the public. 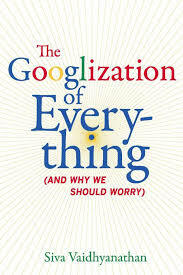 The main threat represented by a private company overseeing a function as important as “organizing the world’s information and making it universally accessible and useful” (Google, n.d.) is the commercial nature of the enterprise, which in the long run will enforce the commoditization of knowledge. Consequently, the democratic values governing society will be displaced as commercial values increasingly inform the challenge of digitalizing and processing human knowledge. This entry was posted in Book Reviews, English, Texts and tagged book review, Google, Googlization, Siva Vaydhanathan, technofundamentalism. Bookmark the permalink. Post a comment or leave a trackback: Trackback URL.